The following presents a commentary on a three-part debate (part 1, part 2 and part 3) conducted, within the pages of ultra-left journal Socialisme or Barbarie, by different representatives of the libertarian communist tradition on the trade unions. The commentary aims to introduce contemporary reflections on the trade union movement using the analysis to draw together anarchist communist strategies towards organised labour in the present period. The debate referred to throughout this text1, taking place through the pages of the journal ‘Socialisme ou Barbarie’ (‘Socialism or Barbarism’) through the years 1954-6, represents a uniquely representative (far too unique in our view) exchange on behalf of the libertarian movement. The protagonists – an automobile worker and rank-and-file union militant, an animating personality of a re-emerging Marxist ultra-left and a Platformist anarchist communist and leading figure of the French anarchist movement – provide a thoroughgoing analysis of both their experience and role of the trade unions in respect to the tasks of revolutionaries. Both the depth and breadth of the exchange provides fruitful points of intersection between the respective traditions in spite of the often polemical character of the debate. Yet we do not reproduce these texts merely as a historical curiosity nor as an exemplar of the kind of relationships that can be practised between revolutionaries. We identify their importance to working class militants over fifty years later in respect to the function these texts have in illuminating a specific logic of revolutionary praxis which we believe needs to be laid bare. This is the traditional relationship of intervention and organisation that has existed in respect to revolutionary traditions and the “workers’ movement” – typically understood in terms of the permanent institutions of workers’ organisation, the trade unions and parliamentary left parties. It is this relationship – still maintained in many quarters as an essential premise of communist praxis - which is being exposed to criticism through these texts. Moreover, the questions which arise in respect to this are relevant to our contemporary challenges; the strangle-hold of the trade union bureaucracy, declining trade union density and the question and role of working class independence. The question of declining trade union density in particular is here faced for the first time in the modern period. To these we could add questions concerning more fundamental shifts in class composition, e.g. the de-industrialisation of the workforce and flexibility, the dislocation of class identity and the increasing experience of trade unions as individualised services, rather than spaces which bring together workers. It is the purpose of this commentary then, in the spirit of our historical materialist understanding of revolutionary self-criticism, to recognise both the continuities and discontinuities that are present throughout these texts. Revolutionary ideas are not proclamations to be delivered from the pulpit, but need continual analysis and revision on the basis of changing experience. The commentary will attempt to situate the contributions in the correct historical and social context, draw out relevant points of analysis and, where necessary, update these in respect to contemporary concerns. On a more thematic level one recurring discontinuity we do identify is in relation to the possible disappearance in many sectors of the “union space” or even the workplace, as is often conceptualised in this debate. This has much deeper implications in terms of the “traditional relationship” described above and the strategies and interventions associated with communist praxis. We offer no definitive conclusions here but pose this as a central topic of future debates and exchanges between revolutionaries. This is, of course, while also being conscious not to dismiss the strongest thread which runs through all of the following contributions, and continues to be more relevant than ever: the transformative powers of the proletariat in respect to capital and the critical force of worker autonomy in respect to this. On this notion, the authors offer a number of insightful issues and we also draw our own, independent conclusions on the preferred methodology adopted by anarchist communist militants in respect to both the trade unions and the workplace in general. We believe that these are confirmed by the better analysis within the texts. Socialisme ou Barbarie was a French-based libertarian socialist group based around a theoretical journal of the same name. Founded in 1948 it had its origins in the Trotskyist Fourth International where two leading members – Cornelius Castoriadis and Claude Lefort – constituted a Chaulieu–Montal Tendency. The group was composed of both intellectuals and workers and developed parallels to the US-based Johnson-Forest Tendency. Both were critical of Leninism and the politics of the existing Communist parties, instead coming to embrace a method of Marxist writing and research rooted in the everyday experience of workers. In particular, the group developed a unique analysis of bureaucracy and the spread of social conflict beyond the realm of production. Castoriadis’ rejection of Marxism in the late 1960s, however, led to disputes within the group leading to its eventual dissolution in 1965. An attempt by Castoriadis to revive the journal during the May 1968 events was unsuccessful. Daniel Mothé was a French automobile worker and union militant based in the Renault factories in Paris-Billancourt. In his diary of his experiences while organising within the factory, collected and published as ‘Militant Chez Renault’, he argued from the standpoint of the workers, commenting on how the management role which unions had adopted were affecting both the production process and possibilities for worker resistance. This text proved to be particularly influential for early Italian workerists. Mothé joined Socialisme ou Barbarie in 1952 and co-ordinated the factory work of the group from his position at Renault. He remained in the group until its dissolution. An anarchist from the age of 17, Fontenis was first active under Nazi occupied France with the clandestine CGT (General Labour Confederation) and Union Anarchiste. Reconstruction of the anarchist movement following the war led to the foundation of the French Anarchist Federation (FA, Fédération anarchiste) of which Fontenis became the youngest member of the provisional administrative committee. Towards the end of the 1940s, becoming increasingly disillusioned with the problems created by the opposing tendencies within the FA, Fontenis formed a faction Organisation Pensée Bataille (OPB) which sought to promote a libertarian communist line within the federation. The work of the OPB proved partially successful in 1952 when the congress of the FA officially renamed itself the Fédération communiste libertaire (FCL, Libertarian Communist Federation), resolved to place greater emphasis on anti-colonial work, more encouragement of members to become more actively involved in trade union work and a more open attitude towards the contribution made by Marxist analyses. In 1956, however, the FCL made the questionable decision to present a list of “antiparliamentary” candidates for the general election, something Fontenis later described as “a rather ridiculous mistake”. State repression, due to its anti-colonial activities, and arrests of key organisers (including Fontenis) led to a period underground and the eventual collapse of the FCL in 1958. In the following years Fontenis would involve himself in much trade union work and various Ultra-Left and anarchist tendencies and correspondence groups although remaining critical of the state of the anarchist movement as a whole. During this time there were a few attempts to form a new libertarian communist organisation, the most promising of which was through the Union des travailleurs communistes libertaires (UTCL, Union of Libertarian Communist Workers), a syndicalist tendency within the Organisation révolutionnaire anarchiste. The UTCL reproduced the text contained in this pamphlet as representative of its own platform and Fontenis joined it in 1980. The following years saw meetings between the UTCL and several other organisations belonging to the libertarian communist or anarchist communist traditions, and this led to the publication in 1989 of a “Call for a Libertarian Alternative”. The upshot was the launch in 1991 of Alternative libertaire(AL) which Fontenis joined and remained a member until his death. Castoriadis became first politically active in his native Greece, joining the Athenian Communist Youth in 1937. In 1941 he joined the Communist Party of Greece (KKE, Kommounistikó Kómma Elládas) only to leave one year later to become an active Trotskyist. During the violent clashes of December 1944 between the Communist-led ELAS and the Papanderou government, aided by British troops, Castoriadis heavily criticised the actions of the KKE. After earning degrees in political science, economics and law he sailed to Paris where he remained permanently. Once in Paris, Castoriadis joined the Trotskyist Parti Communiste Internationaliste but broke with it by 1948. He then joined Claude Lefort and others as a founding member of Socialisme ou Barbarie. Castoriadis was particularly influential in the turn of the intellectual left during the 1950s against the Soviet Union, arguing that the Soviet Union was a bureaucratic, not communist, state, which contrasted with Western powers mostly by virtue of its centralized power apparatus. Throughout the 1970s Castoriadis would distance himself from Marxist thought as well as the activities of the organised left, however autonomy, radical change and social criticism would continue to be recurring themes throughout his increasingly influential philosophical works. Mothé’s analysis of the trade unions has a single overriding theme – to show the way in which trade unions, organisations which claim to operate in workers’ interests, undermine and sabotage the struggle of workers against their bosses. The techniques Mothé highlights, moreover, are not altogether dissimilar from the kind of divide-and-rule strategies that bosses employ on the shop floor and the state pursues against workers as a class. His argument seeks to highlight the equivalence between both trade union and capitalist management and the need for workers to form an independent front – in the form of councils or assemblies – against the interests of both. He highlights a simultaneous policy of “neglect” and “hostility” employed by union bureaucrats which aims to foster a condition of dependence within the membership, on one hand, and enforce discipline, on the other. Tactics such as the control of information, the cutting down of deliberation and debate to favour the status quo, the use of professional speakers at public events and the transformation of collective discussions between workers into a monologue for union officials – things which should all be familiar to contemporary readers with experience of the trade union movement – all serve an essential purpose, to shore up the position of the union official. They undermine any possibility for independent working class organisation by making the role of the union bureaucrat both indispensable as well as ultimately in control of the level and direction of workers’ organisation. This is much in the same way that an employer will use similar techniques to control their workforce and mystify their own function in the production process. The results produced are the same for both processes: to de-legitimise ideas and practices of self-management. This condition is encouraged by workers’ passivity and dependency on the boss and union official (for wages and instruction in the case of the former, negotiation and protection in the case of the latter) but is also actively reproduced through the production process itself. There is also however a wider historical context to this analysis. Mothé’s experience is of the discipline associated with the Fordist factory, the broader picture of which is a specific economic settlement dependent on a close trade union alignment with capitalist productivity. Trade unions, to put it simply, over this period exchanged gains in the “social wage” and wage-rises (in the form of nationally brokered agreements) with the state for promises on labour productivity. This was a process predicated on labour discipline at all levels of trade union organisation. In contemporary terms in Western Europe the trade unions have tended to mirror different aspects of the capitalist production process than those associated with the Fordist factory. This includes the growth of a service-based unionism and an individualised model of union membership (where a union card approximates personal insurance) to suit the more consumer driven, atomised nature of working life under neoliberalism. Likewise in the UK, the “new realism” of the trade unions has meant an acceptance of the disappearance of trade unions as partners in state planning and a move to more local partnership with employers. That is not to say the trade union’s responsibility for discipline is a situation unique to the period described; a function of the union is to negotiate terms of capitalist exploitation (the sale of labour power) and this will inevitably involve some exercise or enforcement of constraint on the part of workers. It is this dynamic in fact which appears to be least understood by Mothé. In spite of his insistence that the union holds little hope for revolutionaries, there are also claims that appear to contradict this within the text. Implicit within his argument for the need for a “workers’ press”, for example, is that his overall objective is tied into the reclamation of some genuine or lost spirit of worker organisation within the trade union apparatus. This is something we must criticise. For us the question of the trade union institutions – the bureaucracy and the legalistic mechanisms associated with negotiation – is an irrelevance to communists. The real question is whether a possibility for worker autonomy exists in the trade union space and what tactics and strategies can communist militants practice should this be the case. The issue of the trade union press may be illustrative – it demonstrates that trade unions seek to control the information of their membership – but in terms of a communist methodology it is generally misplaced. Any militant line necessarily has to emerge from the workers themselves and their own press organs. It has to be a product of the consciousness that exists, not something that precedes it. In other words reflective of relationships as they exist between workers within the union, something that is our true concern. It should be the principal task to build these relationships first. For this reason we see the growth of social solidarity in the workplace as our primary goal and judge the use of trade unions in the workplace on the basis of this. 1) If unions can act as a catalyst for worker unity (not in the actions of the union bureaucracy but in the actions of its membership in opposition to that bureaucracy) should this not be of concern to revolutionaries irrespective of the “revolutionary incapacity” – a characteristic already well outlined by both Malatesta and Lenin respectively – of the trade unions themselves? 2) Unions provide a potential permanent space for the “tension of the working class towards unification” whereas strike committees and councils (the forms of organisation that Mothé advocates), which often act like militant unions in practice anyway, are ultimately temporary. It is unclear whether this analysis applies so strongly to the contemporary experience with the trade unions in the UK; we discuss this in greater detail below. 3) While Mothé is correct to argue that working class unity exists both outside and beyond the trade unions it is also necessary to acknowledge from a historical perspective that the formation of organisations outside of those that are permanent, defensive and conservative has only occurred during “an openly-revolutionary period”. Fontenis does raise a fourth, admittedly rather cursory, concern about Mothé’s claims of the increasing irrelevance of trade unions to sections of the working class (which he claims to be over-exaggerated). In fact, as our data shows, Fontenis is mistaken on this point. France experienced a rapid decline in trade union membership through the early 1950s to abate slightly in the 1970s only to return to a continuing decline up to the present period. This is a situation that is mirrored in most Western European states over the last half century, including for the UK. The cause, however, is far broader than the ineffectiveness of the trade unions that are both Fontenis’ and Mothé’s focus, although undoubtedly this would be a contributing factor in certain circumstances (particularly in the case of Mothé’s workplace at Renault). This decline relates to far deeper socio-political shifts in class composition and managerial structure, decline in concentrated heavy industry, increased flexibility, conservative shifts in the class, improved access to home ownership and social security outside of the negotiated social wage, dislocation of class identity and, particularly in the UK, the state repression of traditional bases of trade union militancy (such as the dockers and the miners) to name but a few contributing factors. Underlying Fontenis’ key claims is the position that revolutionaries should be engaged in the “immediate issues” of the class. However conservative and small these may in fact be. He argues is important not to downplay the role of such activity because it is only through gaining the “consideration and trust of the workers” during periods of inaction are revolutionaries in a position for the “setting of new organisms, such as councils, during periods of militancy”. Fontenis’ response to Mothé, in short, is not to criticise his stated objectives – the formation of workers’ councils or strike committees – but the methods by which it is possible to achieve this. In essence, “we fight within unions, taking into account what they are and what limits they have” while also not neglecting that “workers’ action is not limited to union activity, and neither do we forget the need to fight on a political level and to politically organise in order to work, outside and within unions, to raise the class consciousness of workers, to subtract them as much as possible from the influence of bureaucrats and to open up revolutionary perspectives to them”. unorganised sections of the workforce, but is increasingly less applicable to even those workplaces with a high union membership where union meetings will often be geographical (therefore not even necessarily putting you in contact with your workmates), service-based or even inclusive of management. These concerns aside, the most pertinent issue raised by Fontenis is that revolutionaries do not have the luxury of choosing their battlegrounds. To adopt a principle of operating at all times outside and against the unions is to also “ignore a lot of potential listeners” as well as to deny assistance to “oppositional factions” in the unions themselves. It is also naive to believe that any space outside of the trade unions is not equivalently compromised by capitalist interests or to the same reformist and conservative turns. Anarchists who have a tendency to hold up the community as some Mecca of class-based organisation should be particularly mindful of this criticism. When housing activists enter into negotiations with landlords or the local council over improved housing or social centres are discussing the best income generators to sustain their project they are engaged in exactly the same mediating and pacifying logics that are present in the workplace. The question, as Fontenis argues, is not how to escape these, but how to best challenge them. Worker autonomy does not emerge as the result of some perfect theoretical calculation on the part of revolutionaries but out of the immediate experiences of the class. This means finding points of engagement as the class is constituted now, however removed from revolutionary goals this may be. It is only through a mass, libertarian movement – through building “trust and confidence” in revolutionary action through these immediate engagements – that that context can be meaningfully challenged. Castoriadis’ intervention into this debate is at a slightly different level compared to the more tactical and strategic concern of both Fontenis and Mothé (although that is not to say his piece does not have its own practical considerations). He aims to point to the deeper implications of the structure of the trade unions (particularly its bureaucracy), to the reproduction of capitalism as a whole, as well as to draw conclusions from the methods of worker resistance waged against this. Developed through his article is a long-standing, and at the time quite influential, thesis held by Castoriadis of the increasing tension between the working class and bureaucracy – both its own and that of capital and the state. In contemporary terms this line is often perceived principally as a symptom of the experience of the Cold War and increasingly irrelevant in light of the collapse of the Soviet Union and Eastern Bloc, from which most of its critical purchase was generated, as well as Fordism and concentrated industry in Western Europe. It would be premature, however, to dismiss it simply on these terms and there is certain value in expanding the framework of the “struggle against bureaucracy” into our contemporary experience. The same forms of factory discipline may be absent from contemporary workplaces but the imperative to regulate has certainly not disappeared. In fact the performance targets and productivity goals associated with precarious/flexible work, as well as the increasing erosion of the distinction between personal and professional time, suggest a far deeper encroachment of bureaucracy on the workplace. Far from delivering us from the monolithic routines of the Fordist factory, neoliberalism has manufactured a much more pernicious, de-centred articulation of capitalist power where the logics of profit and consumerism colonise almost every part of our working life from the length of our tea breaks to the make-up of our social circles. The trade union bureaucracy has retained its partnership role in respect to this only to be supplemented by the added discipline of surveillance equipment and managerial stratifications throughout our workplaces. If bureaucracy may appear as a sometimes dated concept in this piece of writing, the second central theme certainly doesn’t – the content of worker autonomy. Castoriadis is concerned, particularly in respect to his study of the strike of Nantes, to find some reconciliation between the autonomous action of workers and often quite reformist and conservative ideas. As he argues, “there is no organisation more autonomous than 15,000 workers acting unanimously on the streets” and yet “for the workers of Nantes, it was a local strike with a clear objective: the 40 Franc pay-rise”. In response Castoriadis argues the content of this struggle as an embryonic expression of the nature of resistance against bureaucracy. Nantes, in a serious way, poses not the possibility of revolution but of working class independence as the medium by which proletarian identities are formed. Castoriadis argues that struggle is conducted on these terms not – as the Trotskyists argued – due to the advanced nature of the workers’ ideas but because “bureaucracy has now obtained an objective existence as an integral part of the exploitation system”. An existence that, in contemporary terms, is no less relevant in terms of the partnership role of the trade unions. As a result the struggle for working class independence – autonomy – is produced “from an experience of bureaucracy pre-dating the action itself” and must be the shape of successful proletarian struggles. Castoriadis concludes that it is this dynamic that sets the political tasks of revolutionary minorities during periods of inaction. Even in “elementary struggles”, he argues, “organised minorities should help the birth of collective and democratic forms of organisation of the mass of workers”. They likewise have a responsibility to argue their opposition to the bureaucracy not as the result of “dishonest” or “bad” leadership but as an integral part of the management apparatus with which all workers must struggle, a “holistic phenomenon, at the same time economic, political and ideological”. The perspectives outlined above present a contrast in perspectives but an ultimate unity in themes. Through understanding these it is possible to bring forward a number of important questions for contemporary militants. Throughout the commentary we have sought to highlight these key points, of which the chief question – that of worker autonomy – retains it central relevance. The authors clearly express their own individual conception of an ideal praxis in relation to trade union work (much of which is not fully covered in the texts) and while it would be unfair to artificially manufacture points of reconciliation in relation to this it is fair to argue a certain harmony in their different points of orientation. From the immediate criticisms of Mothé born from his participation in struggle, to the patient pragmatism of Fontenis to the broader, socio-economic perspective of Castoriadis, each in their own right outline useful insights to the questions at hand at their respective levels. Through all this one point is clear – that worker autonomy is the necessary medium of proletarian struggle and that the trade unions, in a myriad of ways, present obstructions to this goal. It is the responsibility of revolutionaries to locate its political tasks in the actions of the class and to prepare for this during periods of inaction. As members of Collective Action we do, however, adopt our own methodology in relation to the workplace as drawn from our tradition of organisationalist anarchist communism and the lessons and experiences of past struggles. We believe that many of these positions are also confirmed in the following texts. Our focus is on the transformative power of the working class and, as such, we judge the success of our agitation and organisation by its ability to promote the qualities of proletarian subjectivity – mutual aid, solidarity and class confidence – amongst workers. This often requires forms of working class organisation that may be, but are not necessarily, found within the trade unions. It also requires the patient building of confidence and trust in militant ideas and methods; something which necessitates a long-term and strategic approach on the part of the revolutionary organisation. It also requires patience and self-discipline on the part of working class militants. We criticise strongly voluntaristic activities that place activist minorities in advance of the confidence and capacity of the communities they claim to organise. In this we seek to strike the balance between combativeness and isolating ourselves from our workmates. We stand against social partnership and for an organising agenda. We argue in all cases for industrial unity and against sectional interests. Only a politically-independent working class acting internationally can fight on terms in which we can win. Finally, we adopt a perspective that is not limited by the trade unions or the workplace. We argue not only for unity between struggles in different workplaces but also those pursuing other proletarian needs – housing, welfare, against racism, sexism and homophobia. We believe that anarchist communist organisations should seek a relationship of influence within all working class social movements not exclusively those in the workplace, seeking to promote anarchist ideas and methods as those most closely aligned with the interests of the class. 1. Our thanks are extended to militants of the Linea Anarco Comunista for making us aware of this debate and recommending it as a source of further clarification for our own ideas. Our focus is on the transformative power of the working class and, as such, we judge the success of our agitation and organisation by its ability to promote the qualities of proletarian subjectivity – mutual aid, solidarity and class confidence – amongst workers. Is Collective Action an infantile disorder? I find it a bit disconcerting that Daniel Mothé's biography does not even include the fact that it was the pseudonym of Jacques Gautrat who is (was?) doing research at the CNRS in France in social studies. This was something unknown to me. Reference to him in English pretty much disappears following his involvement with SoB. Some people say, “Money is more important than time.” Some say, “We can buy everything with money.” For some people, money is everything. They think they can buy everything they want, including time. Do you think so? No. I don’t think so. Because when money is spent, we can get it back. However, when time has gone, it will never return. Nevertheless many of us always waste time and put off today’s work till tomorrow.In fact, time is more important than money and time never stops for anyone or anything. For everyone, time is so limited that if we waste our precious time, we won’t get it back. Therefore, we should save every second we own and make full use of our time to study hard. The harder we work now, the more we will get in future!Let’s save time together!I live in a village, so I’m a villager. Many people think that it is a pity to live in the countryside, but I think it’s lucky to be born there.In the countryside, many people, including my parents, are not well educated and they’re poor. However, when I was a child, they taught me the first lesson that was important in my life. “We are poor, but we can live with smiles.” They try their best to send us to school. Even though they’re as poor as a church mouse, they never give up offering us a chance to receive education. In face of difficulties, they never say no.In the village, there are green trees growing, fragrant flowers blooming and clear rivers flowing around. Birds fly up and down; animals jump here and there; wheat plants dance in the wind. What beautiful sceneries they are!When my unfriendly classmates laugh at me at school, I say nothing. I don’t care about anything they may say or think, for I love my village deeply. She has given me spiritual support. I don’t compare my classmates’ parents with mine. But I will compare my future to theirs. I will make every effort to improve my school records. As a saying goes, “He who laughs last laughs best.” I’m sure I’ll be the one who laughs best.No matter where I go, I will never forget the village where I was born and brought up. 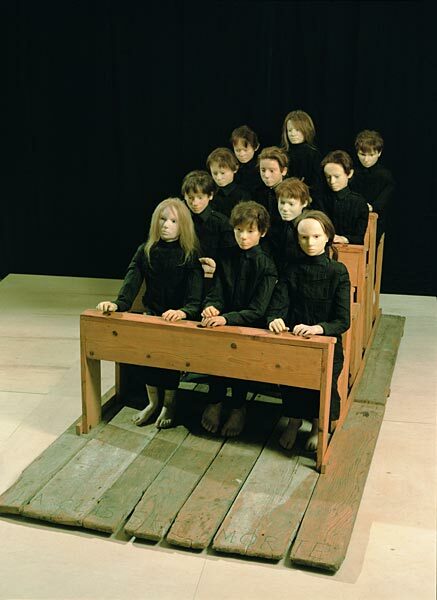 The image is an installation called Dead Class by Tadeusz Kantor. Collective Action is an association of anarchist communists based in Britain. We see anarchist communism as an engaged tradition of working class socialism and our theory is informed by both our experience and our continuing participation in social struggles. Our project is to re-visit our political tradition, re-group and re-kindle our political action.